The incident history of gas distribution pipelines reveals infrequent pipeline incidents. 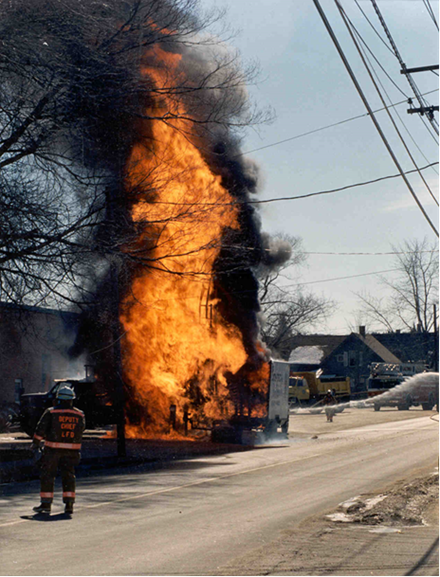 Since 1989, six incidents have occurred in New Hampshire-see Historical Gas Incidents Chart. No fatalities or bodily injuries have resulted from these pipeline safety incidents. 2015 Keene NH: In December 2015, the Keene division of EnergyNorth Natural Gas Corp. d/b/a Liberty Utilities (formerly New Hampshire Gas) experienced an abnormal quality of gas mixture being introduced into its gas distribution systems. Plant equipment was affected by voltage fluctuations that in turn caused the blower equipment to shut down which significantly and adversely affected the normal propane/air mixing process used for systems supplies. 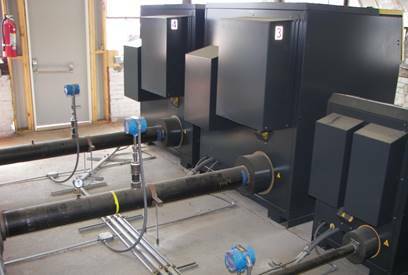 This resulted in a higher British thermal unit (Btu) gas mixture being directed into the distribution systems and significantly contributed to incomplete fuel combustion at some customer appliances. The incident did not result in any property damage, bodily injury, fatalities or loss of gas in excess of 3 million cubic feet but was deemed “significant in the judgment of the operator” as allowed by federal regulations. A report was submitted to the Commission by the Safety Division in Docket # IR 15-517. 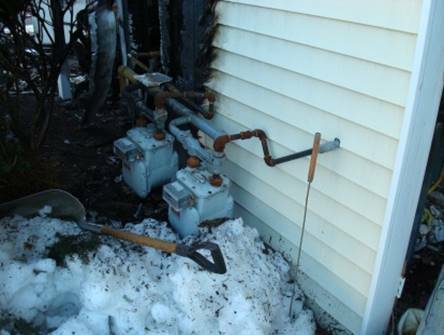 2015 Hampton NH: Unfortunately, in February 2015, a house in Hampton caught fire as a result of a natural gas leak near a meter set at the foundation of the home. The gas piping was owned and operated by Northern Utilities, Inc. 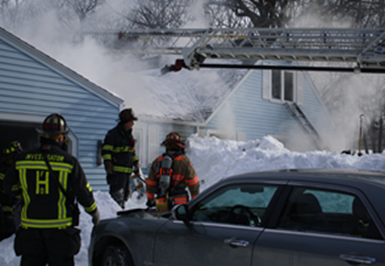 The historic and excessive snowfalls in February 2015 resulted in shoveled snow from the roof damaging the meter and subsequently the ensuing house fire resulted in excess of $150,000 damage. Fortunately, the residents were able to evacuate the premises without serious injury. Click here for report. 2008 Rochester NH: After a winter snowfall, threaded piping near a gas meter set at the foundation of a duplex apartment complex leaked as a result of a broken gas riser pipe. The Northern Utilities, Inc. gas meter pipe broke as a result of either excess snow accumulated on top of the gas meter or a private snow plow operator pushing excess snowfall onto the meter set. Meter protection was not a factor. The meter set was directly outside of a gas furnace used for heating which was the source of ignition. No fatalities or bodily injury occurred and approximately $200,000 of property damage occurred to the duplex. 2005 Hampton NH: During a multi-year municipal street reconstruction project for the Hampton Beach area, an excavator working as a subcontractor damaged a six inch diameter polyethylene (45 psig MAOP) gas distribution main owned by Northern Utilities, Inc. that was a major feed for the local area. The excavator using a pavement reclaiming machine struck a shallow gas main lacking proper cover requirements and protection. 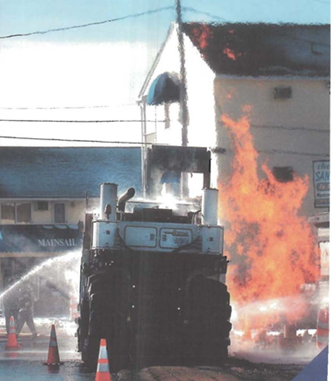 Ignition occurred and the cab of the reclaiming machine caught on fire causing approximately $520,000 in property damage and fortunately the machine operator escaped from the seat of the cab. No fatalities or bodily injury occurred. Violations were administered to both the excavator and gas operator by the Safety Division. Subsequently the shallow gas main was replaced in its entirety with a deeper main and trenchless technology provisions were made to the state underground damage prevention administrative rules. 1990 Laconia NH: During the late winter season, a drilling excavator operating on behalf of the City of Laconia providing core samples of soils for a proposed roadway improvement project drilled through a six inch diameter coated steel gas distribution main located in the shoulder of the travel way. Dig Safe notifications had been made and the location of the gas main was properly marked. A space heater used near the excavation site was the source of the ignition which resulted in a fire damaging the drilling rig and an associated equipment vehicle. The excavation damage resulted in no fatalities, no bodily injury and caused approximately $85,000 in property damage mainly from the construction equipment catching on fire. Over 600 EnergyNorth Natural Gas Corp. natural gas customers required shutting down and relighting during the repair of the single directional flow gas distribution feed.